Hey guys we need your help! Unfortunately on Wednesday, 4/18/12, at Performance Cycle an Icon Accelerant Black XL jacket, an Icon Motorhead Black XL jacket, an Shoei RF-1100 TC-5 Large Helmet and an Icon Shakki White XL Helmet were stolen. We are a family owned business and it’s a shame that people like this are a part of our sport. If you recognize the men in the pictures below, please help us find them. A reward will be given for information that leads to finding them and getting the products back. Any information can be anonymously given to Lance at 720-289-4984. Thank you! 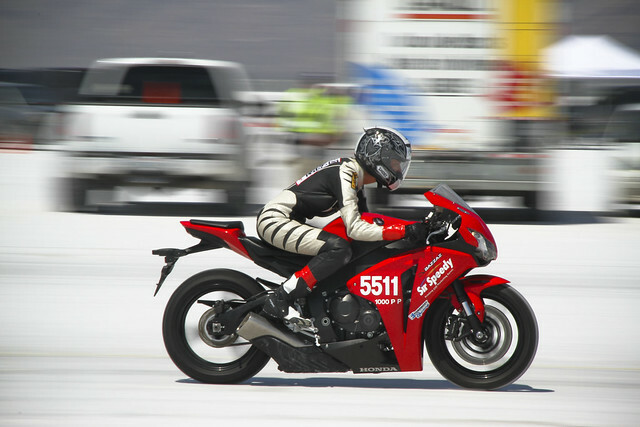 Leslie Porterfield is the “Fastest Woman in the World on a Motorcycle.” Well qualified, her top average through the mile is 240 miles-per-hour! She owns her motorcycle shop in Dallas called High Five Cycles. Opened in 2005, her shop is a non-franchised pre-owned motorcycle dealership. All has not gone smoothly. In 2007, she had a bad accident at Bonneville Salt Flats in Utah. “I actually didn’t break any records. I broke seven ribs, punctured a lung and had a concussion and I came off the bike at a little over 100 miles-an-hour”, Porterfield said. That didn’t stop her, she rebuilt the bike, and got back on. Leslie would like to go beyond, “I’d like to be the fastest person in the world on a motorcycle.” On the flipside, this year Leslie set the World’s SLOWEST record on two wheels on a Honda Ruckus 50cc. This will most likely get her another Guinness Book entry. Just another day for Leslie. Recently, I decided to add a headlight modulator to my bike. For those not aware of this technology, a headlight modulator is installed in the power supply to your headlight and makes the intensity of the light fluctuate during daylight hours. The reason to install a modulator is that it increases the visibility of the bike to car drivers. Having your headlights on during the day used to mean you were either a motorcycle, or in a funeral procession. Since the advent of daytime running lights on cars, the single motorcycle headlight does not stand out like it once did. The modulator is a game changer in this area. This device improves visibility any time the motorist has a frontal view of the motorcycle – for instance, the driver in oncoming traffic who is making a left hand turn, a driver pulling into traffic, or a driver moving in the same direction who may potentially change lanes into the path of a motorcycle. In the latter situation, riders should consider a lane position that maximizes the motorists’ probability of seeing the headlight in their side mirrors. Modulators are a legal lighting accessory in all 50 states. While it may appear that they are alternating between high and low beam, they are actually only alternating the intensity between about half to full intensity of the high or low beam setting. There are different features and configurations that are offered with modulators. All modulators include a photocell that turns the modulation feature off at dusk, which is a DOT requirement. You cannot change the setting of the photocell but can influence its operation by where you place it on the motorcycle. The instructions for mine recommended placement in a position pointing downward to protect the cell from the elements. I installed it pointing downward in the cowl above the speedometer/tachometer cluster. Because it does not receive direct sunlight, it turns modulation off earlier than if it were aimed at the sky. Another feature the user can control is whether the modulation operates on high beam, low beam, or both. I set mine to both, which means during daylight, the headlight modulates regardless of whether the beam is set on high or low. Some riders may prefer to limit modulation to the low beam only or high beam only. My modulator allows the rider to toggle the modulation on or off by rapidly switching between high and low beam, returning the headlight to non-modulated operation. This feature is helpful if you need to aim the headlight or measure its normal operating intensity. Another feature is an interconnection to the bike’s horn that causes a rapid modulation of the light when the horn button is pressed. The advertising and literature on modulators do not hype this aspect, but I believe one characteristic of headlight modulation that helps get the attention of motorists is that it mimics the modulation of headlights installed on many law enforcement vehicles. The fluctuating intensity gets the motorist’s attention and the first association may be that there is law enforcement following. It may prompt him or her to put down the Big Mac and hang up the phone. Regardless, anything that helps motorists see a bike is a good thing. The module I bought costs about $60. These can be obtained on the internet or from your local bike shop. Bike shops may charge $100 or more to install, depending on the size and complexity of the hookup. Soldering connections costs more in labor but is preferred over using crimp connections that come with the kit. Installation is a fairly easy process for the rider, and step by step instructions are included. If you do not want a certain feature (like the horn-triggered modulation or high beam modulation) you simply do not connect those wires. Some modulators are larger than others. My unit is about the size of a matchbox with six twelve-inch wire leads. I mounted it up and under the console cover of my Pacific Coast 800. I did the installation in conjunction with replacing the windshield. Getting behind the plastic can be a challenge. Cruiser riders may want to select smaller modules if they want to install them inside the headlight housing. The Vyrus 986 M2 is a custom racer built on a Honda CBR600RR engine, and uses the engine as a stressed member, and no telescopic forks. Instead of forks, it uses rods, levers to connect to the handle bars. Built by Ascanio Rodorigo of Italy, the steering is called hub-center steering, which can provide huge advantages on the track, keeping weight balance neutral. Will this setup bring about a huge change in the future of suspension? Most of the body is carbon fiber monococque, reducing weight. Vyrus plans to introduce a race ready bike, a street legal sportbike, and a kit bike (bolt in your own CBR600 engine).